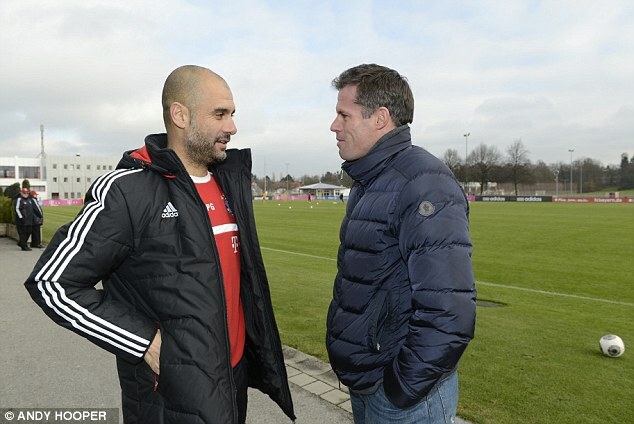 The last time I shook hands with Pep Guardiola, I was feeling pretty happy. 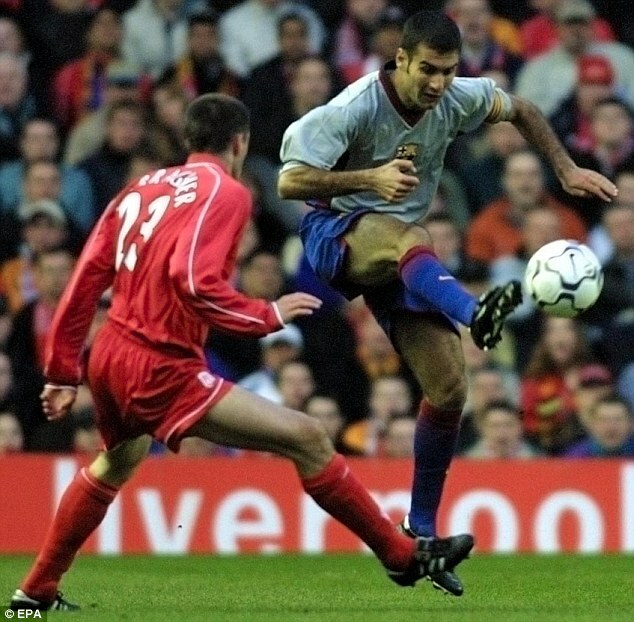 It was April 19, 2001 and Liverpool had just beaten Barcelona 1-0 at Anfield in the UEFA Cup semi-final to knock them out. Guardiola the player was an artist, a midfield master who used to give demonstrations in the art of passing. Now it is December 5, 2013 and I am shaking hands with him again. If he was impressive as a footballer, he is even more so as a manager. 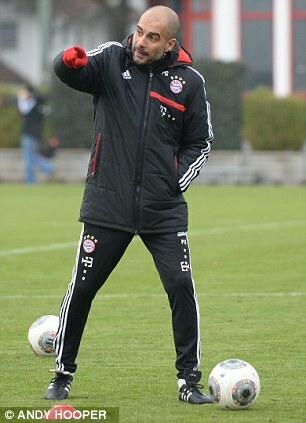 This is the most sought-after coach in Europe, a man whose Barcelona side revolutionised the game as we know it. But he’s welcoming and comfortable in his new home. He doesn’t like to give interviews and protects his privacy, but he has conformed to the Bayern Munich way of open training sessions — sometimes in front of 7,000 fans. 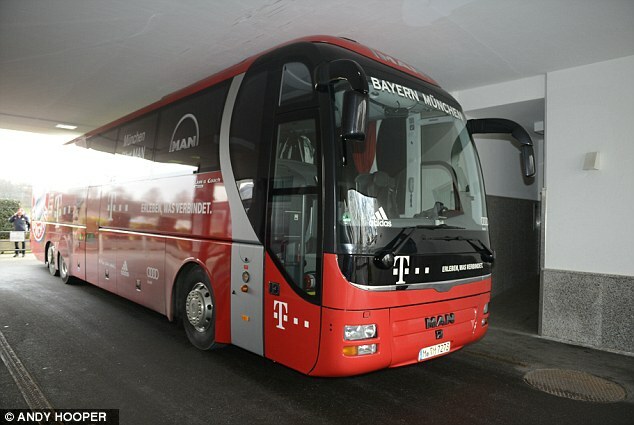 I’ve come to Munich, home of the European Champions, to see what all the fuss is about. Over the space of three days, I see Bayern defeat Augsburg in the German Cup, watch Guardiola close up conducting a training session and spend time with the legendary Karl-Heinz Rummenigge. The undisputed highlight, however, is watching Guardiola at work. The stories you may have heard about his intensity and attention to detail are all true. I was at Sabener Strasse, Bayern’s training base, the morning after they had beaten Augsburg 2-0 and the first thing that struck me was Guardiola actually took the session. For most managers, the day that follows a game usually provides a chance to take things a little easier but that, clearly, is not Guardiola’s style. From the moment he shouted, ‘Allez!’, ‘Super’ and ‘Go!’ during one passing drill to start the session, he never switched off. During a drill to improve crossing, Guardiola fired a look of dismay at one of his assistants when the session wasn’t going according to plan. 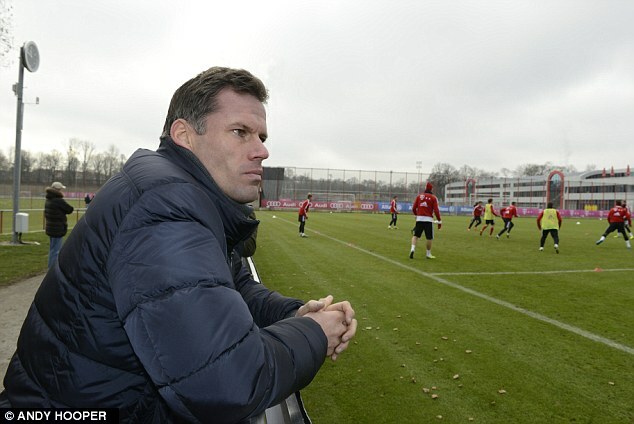 Towards the end, he was heading off the pitch when he noticed an exercise with some of Bayern’s Academy graduates was not going how he liked. He immediately doubled backed and corrected the players’ movement, stressing how it should be done. Throughout, the Spanish coach speaks fluent German, a language he mastered during his sabbatical in New York and first aired in front of 250 journalists when he was unveiled in the summer. He speaks English effortlessly when we talk later. Once he is totally satisfied, he heads back to his offices and it is then we speak. 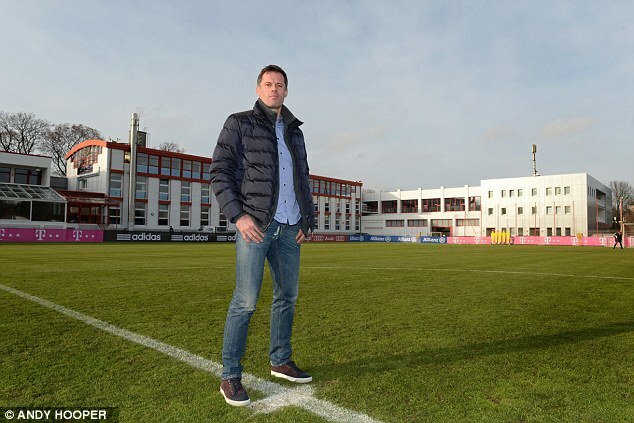 He tells me about how much he is enjoying the challenge of managing Bayern; he raves about Philipp Lahm and explains how this defender could play in any position thanks to his understanding of the game. Talk then turns to the previous night and the victory in Augsburg. From being there, it was clear to see what he has brought to the team — the use of a false 9 in Mario Gotze, playing without a conventional target man and the relentless possession and the immediate press when they lose the ball. The elegant and powerful Javi Martinez features highly in the discussion. The Spain international started the game as an attacking midfielder, supporting Gotze, but he drifted back and into the role of sweeper to keep control of the midfield area. 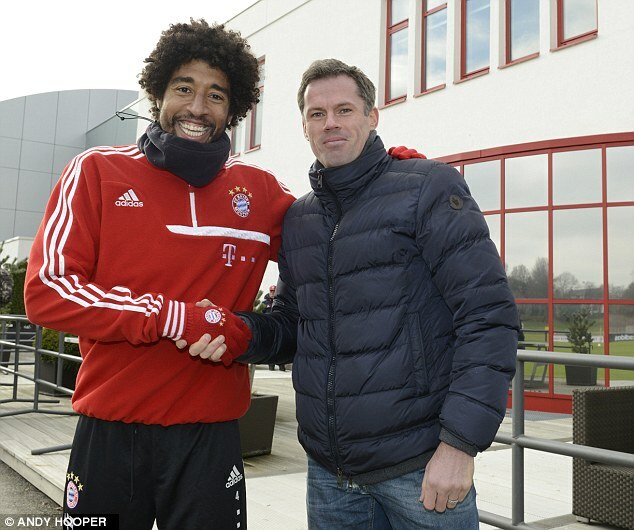 Such talent and understanding of the game is keeping Bayern ahead of their rivals. How the English game lacks players like Martinez and Lahm. People talk about a lack of technique but, for me, the bigger problem is the understanding of the game our players have, which enables them to play in a variety of positions during the same game. There are players in England who could play with such flexibility. Steven Gerrard, for instance, could play as a sweeper and adjust like Martinez, but too many English players cannot. After Pep moves back into the main building (he is staying the whole day and leaves at around 5pm), Sportsmail’s Dominic King and I have a look around. 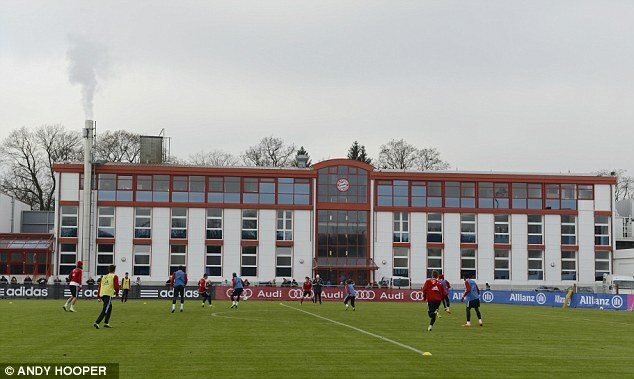 It is fair to say Bayern’s training ground is simple, functional and spacious. It doesn’t compare with some of those futuristic bases in the Premier League, such as Liverpool’s Melwood, Chelsea’s Cobham complex or what the Manchester clubs have been building in Carrington. 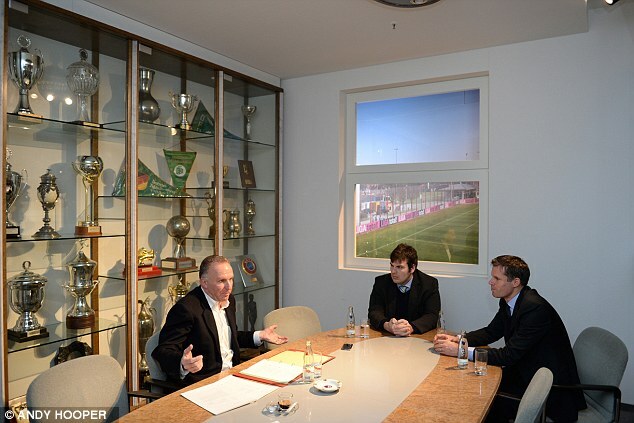 Bayern are building a new base, but that will focus on the development of the next generation of German stars. 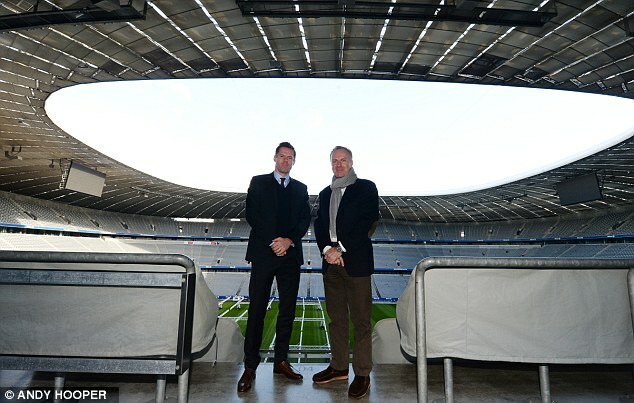 The wow factor at this club, however, comes at the Allianz Arena. It is the best modern stadium in the world, although Bayern’s glorious past is embraced and the club museum which houses the three trophies they won last season is dripping with their proud history. There are shrines to Franz Beckenbauer and Gerd Muller. Our guide, Martin, tells us Bayern would be nothing without Muller and it was humbling to meet ‘Der Bomber’ at Sabener Strasse. 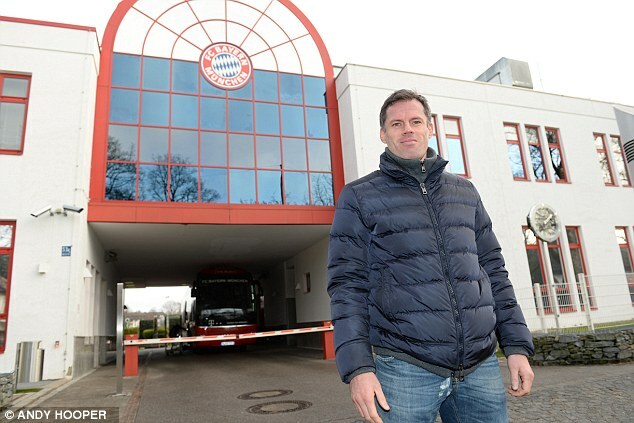 Part of Bayern’s strength and style comes from how they include their past in their future and former players still surround the place, from the boardroom down. A 12-minute video is played at the end of our tour and it features the heartbreaking defeats they have suffered, most notably the 1999 and 2012 Champions League finals against English opposition; not every club would have the humility to show the bad times. 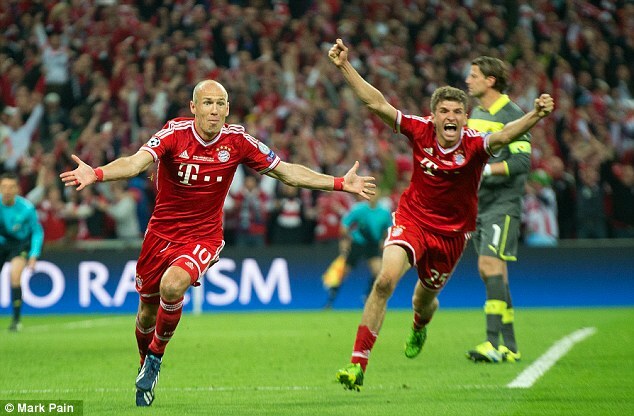 But that is one aspect that particularly impresses about Bayern. Another is their mental strength. It speaks volumes for their resilience that, after those losses to Manchester United and Chelsea, they were able to respond by winning the Champions League. 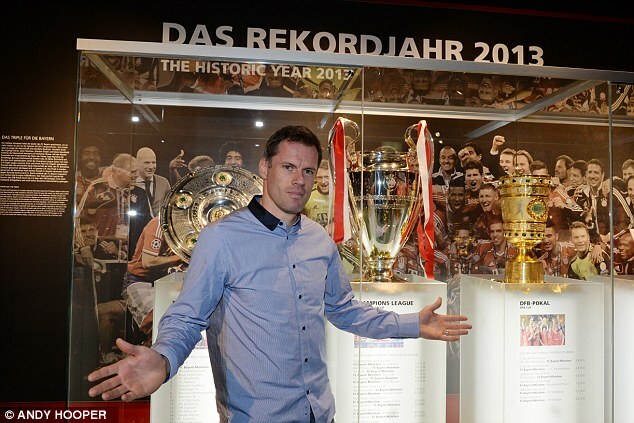 That trophy is at the forefront of Bayern’s mind. 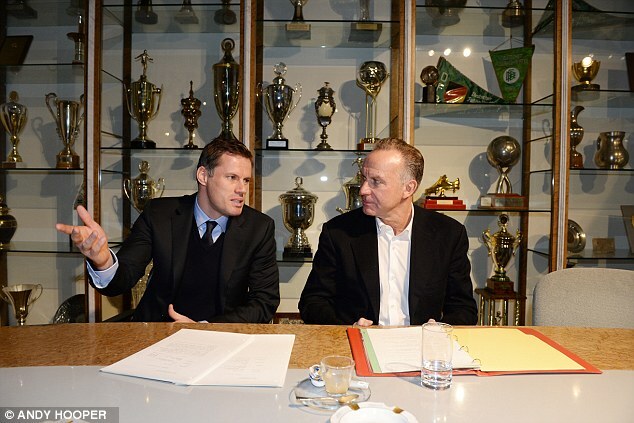 They want to match Barcelona and contend every year. 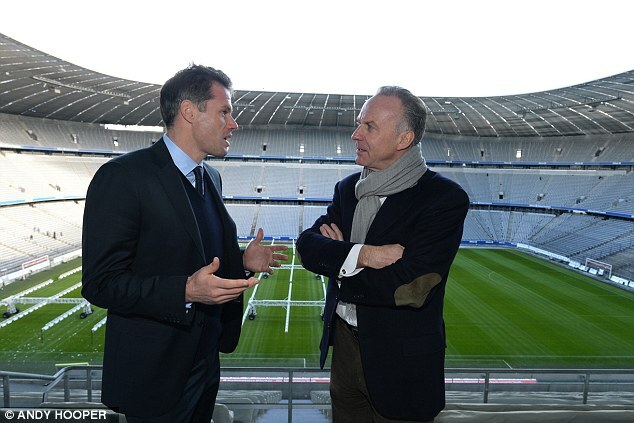 It was apparent speaking to Rummenigge the disappointment he felt that Bayern had gaps of 25 years and 12 years without winning club football’s biggest prize. Now they have appeared in three of the last four finals. They don’t demand that Guardiola must win the treble this season — or even retain the Champions League in Lisbon next May — but, as a club, they are determined to win it again soon. It will help their attempt to grow their appeal in New York and Beijing, where they will open offices soon. 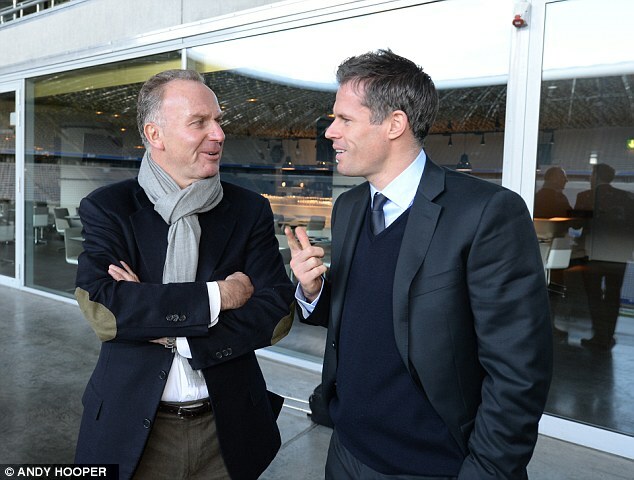 ‘I got the impression at first that Pep felt some pressure to do what Jupp Heynckes did,’ says Rummenigge. ‘But I said that is not important to us. We just want to be in a stable place on the pitch. We don’t want to go up and down as we did in the last 15 years. 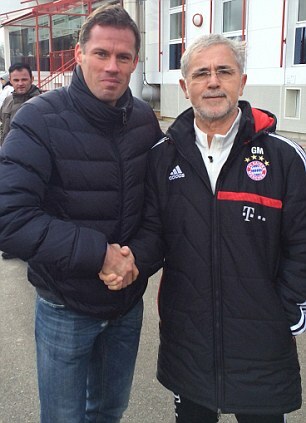 And Guardiola looks very happy here in Munich. They are the European Champions, they claim to be the ‘most valuable club in the world’ and the English clubs looking to keep up with them have some work ahead. Bayern are currently in a league of their own. IT was both surprising and very disappointing to hear David Moyes was subjected to almost constant abuse from Everton’s fans at Old Trafford on Wednesday. I understand that emotions were running high. I also understand Evertonians have been unhappy with some of the things Moyes has said since he left Goodison Park, not to mention angered by the aggressive pursuit of Marouane Fellaini and Leighton Baines. But those same fans should stop and think about what type of club they supported before Moyes arrived on Merseyside in March 2002. He transformed things, gave them back their pride and turned Everton into a team that regularly finished in the top seven and qualified for Europe. Moyes took great pride in being Everton manager and there is little doubt the songs aimed at him from the away section will have hurt; I would hope when he returns to Goodison on April 19 next year, he gets a warm reception and those who mocked him can see why it was wrong. 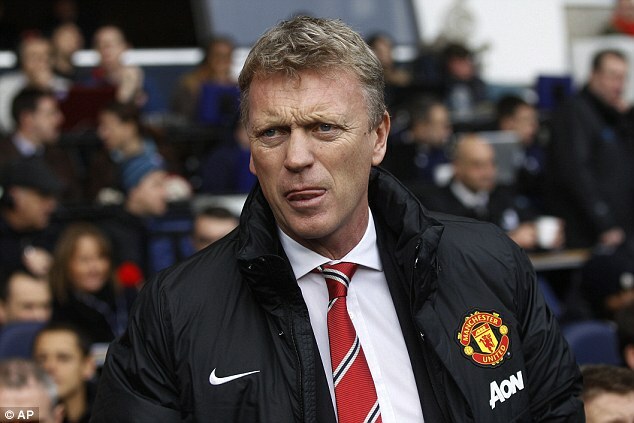 What will have hurt Moyes most, though, was the result. 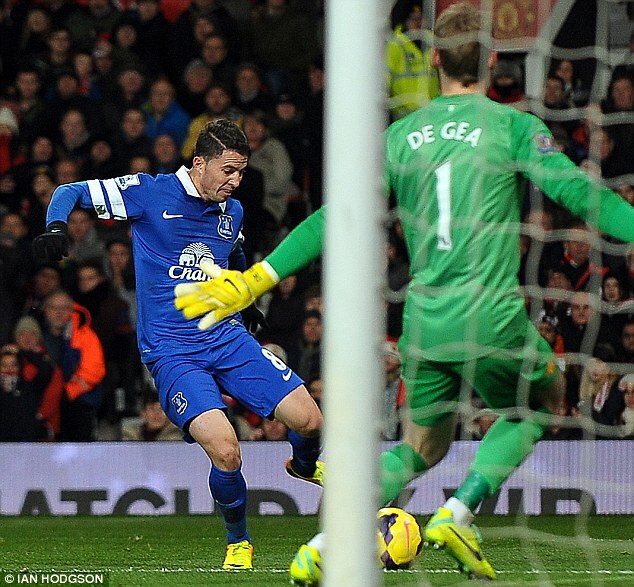 The only slight consolation may come from the man who scored the winner — Bryan Oviedo has now got two goals and helped keep two clean sheets in the absence of Baines. Were United to make a significantly improved offer for Baines next month, Roberto Martinez may possibly think twice about it because of the way Oviedo has emerged. 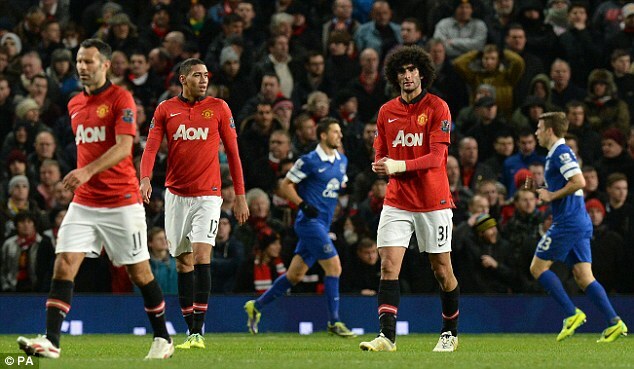 What was also evident again on Wednesday was United’s need to strengthen when the window opens but, as Moyes will find out, top players play Champions League football and the clubs United want to buy from do not want to sell in January. Luis Suarez proved once again in midweek why he is in the top five players in world football with four goals against Norwich. Who knows where he will be next season? 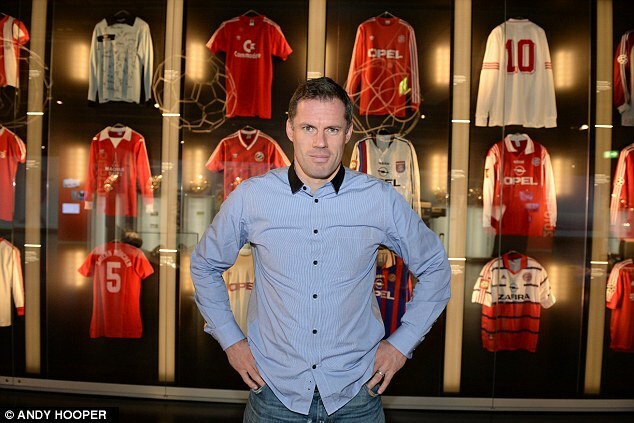 So Premier League fans — not just Liverpool supporters — should just enjoy his genius. And now England have to cope with his threat in the World Cup. Here are my five favourite Suarez moments. 1 50-yard lob at Norwich — We had seen Luis score goals like the one he did at Carrow Road in April 2012 during training sessions at Melwood. To see him do it in a Premier League game, though, was something else — that was vision, audacity and execution at its finest. 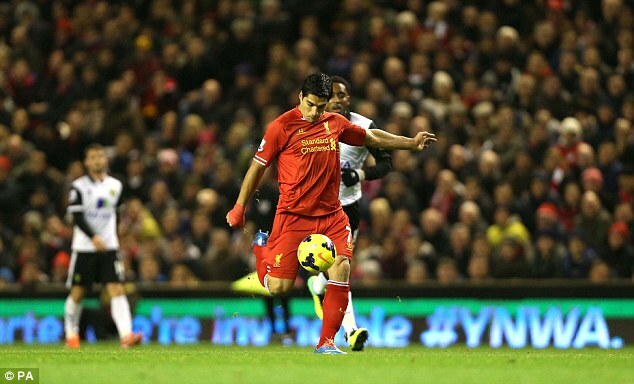 Hat-trick complete: Luis Suarez scored a sublime chip against Norwich last year… remind you of anything? 2 Touch of magic against Newcastle — He scores outrageous goals and tap-ins but this one, in November 2012, in front of The Kop was sublime. The ability to take a 70-yard pass on his chest, get the ball under control, hold off a defender then waltz around Tim Krul was breathtaking. 3 Bamboozling Manchester United’s defence — It shows how good Luis was in his first match against United that it often gets overlooked that Dirk Kuyt scored a hat-trick. I remember seeing Luis twist past four defenders and thinking ‘how is he doing that?’ when he set up one of Dirk’s goals. 4 35-yard volley against Norwich — When I saw the first goal he scored on Wednesday night, I couldn’t say anything other than ‘wow’. The more he produces moments like that, the more you start to think he could actually be Liverpool’s greatest ever player. 5 Nutmegs — Luis keeps doing this trick but he is so good at it, defenders can’t stop him. You think you are about to tackle him but he pushes the ball through your legs and you are left in a heap on the floor. I lost count how many times he did it to me in training.